This is my entry for Zak’s “beer and time” competition. We’ll start with the basics. As you probably know, this type of travel relies on “anchor points”: the vivid moments in past experience which call us back through time. Experiments have shown that beer is peculiarly effective in enabling us to access anchor points. As we’ll see later on, anchor points don’t have to be uniquely memorable peak experiences, although these are ones which beginners will generally use. And rest. Use the beer. This isn’t so much a single lesson as a series of practical exercises. Remember the anchor points? Yes, that’s ‘points’, plural! Use the beer. What is it – a wheat beer, a stout, a Trappist ale? Close your eyes and travel back to the first time – that cafe, that sunny day, the smell of yeast, the sound of foreign voices and the taste of cold beer under an inch of head; that first astonished swallow of Guinness Foreign (what is this stuff…? ); that holiday when you worked your way through the Chimays… You’re there. And you’re here, but you’re then. And you’re back. Relax. Use the beer. Lesson 4 is for advanced travellers only. You have been warned! Don’t rush it; use the beer and relax. You’ll know it when you find it. Lesson 4 is about the ultimate form of travel: travel within time. At a certain moment – you’ll know it when you reach it – the anchor points stop mattering. All that matters is this moment: this moment that’s perpetually coming into being and perpetually fading into nothing. With enough beer you can surf the wave of the present moment: you can feel the passage of time. All you need to do is relax and let yourself be in that moment. The new Wikio rankings are out, I read here and here and indeed here – nice one, Sid. Wa-hey! I thought (which isn’t easy), Oh Good Ale’s first month as a Wikio-ranked beer blog! What’ll it be – 203rd? 142nd? possibly even something in two figures? I checked the site immediately, then felt like an idiot for not noticing the date – it was only the 3rd of November; Wikio rankings might have been decided, but they weren’t due to be published until the 5th. Well, here it is the 5th of November, and 4.20 p.m. as I write. The new Wikio rankings are out. No, they’re not. They really aren’t. H’mph. I’ve a good mind to demand a refund. Update 7.55 p.m. and the new rankings have arrived. All things come to those who wait, wait again, get tired of waiting and grumble ineffectually, then go back to waiting. Oh yes. One hundred and nine with a bullet. It’s not the one after 909 and I am not the 801 – in fact I can’t think of any relevant musical references at all – but it’s a solid mid-field position; in fact it’s a higher ranking in real terms than all but 108 of the other Wikio-registered (wine and) beer blogs. Next month I aim for double figures. And after that, the world! Free beer! What a beautiful phrase that is. Like several other beer bloggers, when I heard that Cumberland Legendary Ales were offering review bottles of their ‘doppelbock’ Croglin Vampire I put my name down sharpish. The goods arrived a week or so ago, and after allowing a decent interval for the beer to recover from its journey I, well, drank it. OK, a bit more detail. It’s a brown beer; no head to speak of but there was a frosting of bubbles on the inside of the glass. As for the flavour, it’s… a big flavour. I was expecting something rich and malty, and I wasn’t disappointed. I can see why Barm mentioned caramel, but that wasn’t what came to my mind; if anything I was surprised how sweet it wasn’t, if you follow. If some beers are hop-bombs, Croglin Vampire is a malt-bomb: rich and fruity without being sweet, with malty aroma at the front of the mouth, a full malty body and a bitter malty finish. It’s a dense and complex flavour, which plays a lot of different variations on that theme of malt – from dark-chocolate bitterness all the way through to a light, banana-like top-note. Not sweet, though, and not at all cloying. At 8%, it doesn’t really drink its strength, except in a certain heaviness in the mouth; there’s certainly no alcohol flavour, and none of the rather treacly malt-extract quality of some strong dark beers. Despite the heaviness, it leaves your palate clear – given a clear enough diary I could easily imagine drinking two or even three of these. My second free beer (I could get to like this beer-blogging lark) was one of the bottles of Dark Energy distributed at the Twissup by the estimable Dave Bailey. I’ve read since that DE is classed as a stout, or possibly that it was originally intended as a stout; all I knew about it when I drank it was that it was 4.9% and it was dark (well, black) in colour. I never would have labelled it as a stout: it certainly has an edge of uncompromising burnt-grain bitterness, but to me that wasn’t the core of the flavour. If pushed I’d have called it an old ale or possibly a mild, but with an odd lightness to the flavour – there’s plenty of malt there but no fruitiness, let alone sweetness – and then that big stout finish. It’s an unusual combination, but it works remarkably well. The only thing I can really liken it to is the cask version of BrewDog’s black lager Zeitgeist (the bottled Zeitgeist is thoroughly inferior). Dark Energy confirmed the impression I’d formed after a half of Infra Red: Hardknott are doing some really interesting things, without much respect for style labels. (Apparently Infra Red is classed as an IPA, but I wouldn’t let that sway you one way or the other – I mean, it’s about as much an IPA as Dark Energy is a stout. They’re both much more distinctive than that.) The two beers don’t taste at all alike, but they both give the impression of someone intent on putting the pedal to the metal – or rather (the metaphor breaks down here) putting two different pedals to the metal and seeing what happens. Why not have a big malty bitter that’s also a big hoppy bitter? Why not have a strong light mild stout? Very nice beers; I would happily pay money for either of these if I saw it on sale, and would encourage anyone who isn’t an incurable hophead to do likewise. 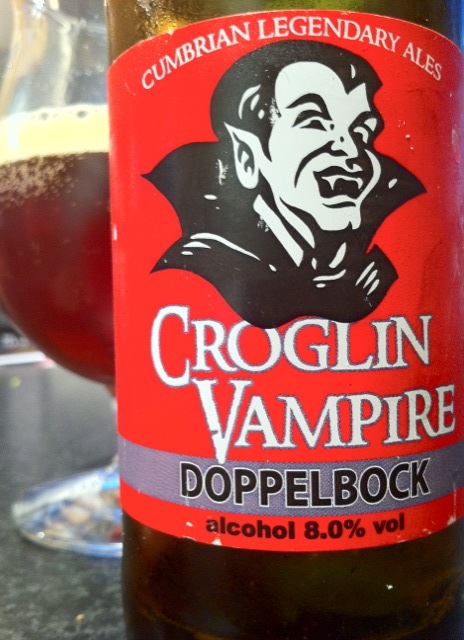 PS The Croglin Vampire picture was borrowed from Andy at Beer Reviews – many thanks.